Of all the complications which arise from diabetes, cardiovascular complications are by far the most prevalent and the most deadly. 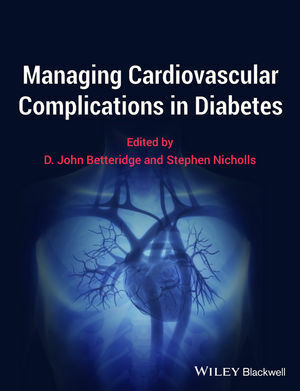 Authored by some of the world's leading names in this area, this outstanding book provides all those managing diabetic patients with clinical, practical and succinct guidance to the diagnosis and management of cardiovascular complications in diabetes. Key points, case studies and self-assessment questions allow for rapid-reference, quick understanding of all topics, thus ensuring that this is perfect reading for endocrinologists, diabetes specialists and cardiologists of all levels managing patients with diabetes and associated cardiovascular problems. D John Betteridge is Emeritus Professor of Endocrinology, Department of Medicine, UCLH, London, and Consultant Physician, University College Hospitals Foundation Trust, London, UK. He is a past Chairman of the British Hyperlipidaemia Association and past President of the Council on Lipids in Clinical Medicine at The Royal Society of Medicine. He is a committee member of the European Chapter and elected Distinguished Fellow of the International Atherosclerosis Society. He is a Fellow of the American Heart Association and a member of numerous international bodies, including the European and American Diabetes Associations and the European Atherosclerosis Society. He is co-chair of the executive committee of CARDS, a major primary CVD prevention trial with atorvastatin in type 2 diabetes. He is the UK Principal Investigator and member of the International Steering Committee for PROactive a major secondary prevention trial with pioglitazone in type 2 diabetes. He is a member of the Joint European Society of Cardiology and European Association for the Study of Diabetes Taskforce on Diabetes and Vascular Disease and was a member of the Medical Research Council Steering Committee for the UKPDS. He was a member of the Project Grants Committee of the British Heart Foundation (2005-2009). Professor Betteridge's clinical interests are in the care of patients with diabetes mellitus and lipid disorders. His main research interests relate to the pathogenesis of atherosclerosis, in particular the role of lipoprotein metabolism. He has authored over 300 publications in peer-reviewed journals. His books include Lipoproteins in Health and Disease (Edward Arnold, 1999), Diabetes: Current Perspectives (Martin Dunitz, 2000), Lipids and Vascular Disease (Martin Dunitz, 2000), Case Studies in Diabetes (Martin Dunitz, 2003), Lipids and Coronary Heart Disease (Arnold, 2003) and Case Studies in Lipid Management (Informa Healthcare ) 2006. Stephen Nicholls is Professor of Cardiology, University of Adelaide and Consultant Cardiologist, Royal Adelaide Hospital, Adelaide, Australia. Formerly Medical Director of Intravascular Ultrasound and Angiography and Clinical Director of the Cleveland Clinic Center for Cardiovascular Diagnostics and Prevention in the US, Dr. Nicholls is a leading international figure in cardiovascular disease and cardiovascular imaging. A fellow of both the Royal Australasian College of Physicians and the American College of Cardiology, he received the Helen May Davies Research Award from the National Heart Foundation of Australia, the Young Investigator Award at the 13th International Symposium on Atherosclerosis and was a finalist for the Samuel A. Levine Clinical Young Investigator Award at the 2005 Annual Scientific Sessions of the American Heart Association. His interests include the functional properties of HDL, the role of inflammation and oxidative stress in atherogenesis and the development of new imaging modalities to assess factors that influence the natural history of atherosclerosis. He plays a lead role in clinical trials that employ intravascular ultrasound to investigate the impact of novel anti-atherosclerotic therapies. He has had 94 journal articles published.